Pagid/Textar Street Formulations ("Black") - Brakeswap.com - Friction for the Win! 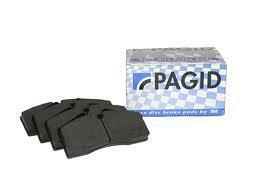 Engineered to deliver exceptional performance, comfort and safety, Pagid is the first choice of many of the world’s vehicle manufacturers. *Specifically developed and calibrated for each vehicle application. *An under-layer provides excellent shear strength and thermal barrier resistance.